“Our second unit is really talented,” said top reserve Taj Gibson, whose 22 points with eight rebounds and 10 of 12 shooting led a suddenly spectacular second unit that supported the starters and sped the rout. “We really take it to the first unit in practice. We talk a lot of trash. You have to have that kind of swag, be motivated to help your team and that’s what championship teams do. That year we went to the Eastern Conference finals, we had a second unit that had swag, understood when we come in the game we are going to work. It’s early, but that’s a good way to start the season off. It was on Wednesday a clinic in depth, team play and rugged attitude as the Bulls starters initially stumbled, falling behind 8-2 and leading 12-10 when Thibodeau made his first substitutions with Aaron Brooks in for Derrick Rose and Gibson for Joakim Noah. “I thought when our bench came in, Taj, those first two subs, and then Kirk (Hinrich) stayed in so we had good ball pressure and Pau (Gasol) finished out the first quarter,” noted Thibodeau as Gasol added 21 points and 11 rebounds in his Bulls regular season debut. The irony was the Bulls pursued the Knicks’ Anthony, who led the Knicks with 14 points. But Anthony shot five of 13 against Mike Dunleavy with Jimmy Butler out injured and the Knicks trying to work for a new coach and work in a new offense. Though uneasy, they matched the Bulls for a bit. But when the Bulls bench extended the pressure, the Knicks bubble burst and the Bulls spent the second half mostly enjoying it with the starters on the bench. Derrick Rose had 13 points and five assists in 21 minutes and Noah played just under 20 minutes with three points and six rebounds. Thibodeau had been raving about Gibson all preseason even as the second unit, at times, seemed somewhat unsettled. But Gibson was magnificent and dominant Wednesday back in his home city and virtually unstoppable in the post and with baseline and elbow jump shots. His pairing with Gasol was dynamic and aided initially by the speedy Brooks, who had nine points in the first half in just under 10 minutes with his beep beep roadrunner game. And then Hinrich in the third quarter added a boost as the Bulls came out pushing the ball as opposed to an early game set offense. Hinrich had 10 third quarter points, including a four-point play and three of three on three-pointers in just under 10 minutes. Overall, the reserves scored 55 of the 104 points despite playing fewer total minutes. It’s a major bonus not only giving Thibodeau the chance to curtail the playing time of Rose and Noah even with Butler out, but being able to rely on the development of a highly functioning second unit that can compete at a superior level. Though it is a work in progress Knicks team, it was Madison Square Garden and a national TV game and a big stage for young players in their first NBA regular season games. Doug McDermott was impressive with 12 points and five rebounds and Nikola Mirotic had five points and seven rebounds in just 15 minutes. “We were getting a lot of slack, a lot of people talking about our second unit not knowing what we were going to do,” said Gibson, who shows no sign of the theorized disappointment about not starting. “But we have a lot of firepower; it’s a really talented second unit. The scary part is it’s a bunch of young guys. They haven’t even really got into the system yet. They were a little timid to take the shot right now. But we keep practicing hard, going against the first unit like we have, guys are going to get more confident. And their number is going to be called. Right now we’re just playing hard nosed basketball; we’ve been practicing really hard against that first unit in practice and it’s been showing. Our second unit is really talented; we really take it to the first unit in practice. It was a scary start for the Bulls in this much anticipated opener against the Knicks of former coach Phil Jackson and Anthony, the almost Bull. It was a stumbling beginning for the Bulls with three turnovers in the first three minutes, five by the time Rose and Noah first departed with the narrow lead. The Bulls were playing too deliberately with the starters walking the ball up in the half court, though it was a good sign that Rose began to attack the basket and would match Gasol with a team high eight free throw attempts in the game. The Bulls finished with 30 free throws to 17 for the Knicks and shot 50.7 percent overall to 36.5 percent for the Knicks. Rose was just three of seven, missing his trio of three-point attempts in a quiet game. Which also was encouraging. Rose came on later in the game with a strong finish to the first half with a driving layup and sprint out of the backcourt and then a couple of quick pull up jumpers in the post halftime avalanche. But the significance was in how little Rose was needed and how second nature questions about his health seemed even with a hard fall on an early game charge. And this became a night when it was Rose talking about his teammates instead of their usual bonhomie toward him and about his play. 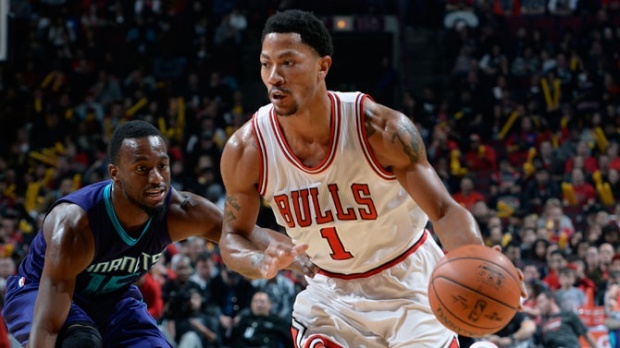 “Taj, he’s being patient with his offense, taking what they are giving him,” said Rose. “They were giving him the jump shot. He kept taking it, making it. It comes with work. That’s what he’s been doing in practice. That’s why he’s been bragging a little bit, talking about beating the first team. He’s in a good rhythm and the second team is doing a good job making sure they are finding him on the court. “You see tonight (Pau), he’s a guy where you have to if you don’t double team he’s going to get up a good shot because of how big he is, how skilled he is,” noted Rose. “We’re just going to keep going to him to make the game easy for everyone. He can pass the ball; you’ve got him and Joakim passing the ball to each other. He and Taj had some great connections on the other end where he hit Taj a few times and Taj hit him a couple of times. That’s all you can ask for. “And (Brooks), the defense,” Rose pointed out. “I think he really got into the other guards defensively. We already knew Aaron is a good guard. He used to start in this league, so he’s been in situations where he had to play starter minutes and he’s used to it. Whenever he’s in the game we know he’s a threat when he’s on the floor. It was that kind of rare game, certainly unexpected and unlike what’s to come with the home opener Friday against the Cleveland Cavaliers and the rivalry expected to dominate the Eastern Conference this season. The Bulls likely will face it without Butler to go against LeBron James. Though Dunleavy despite going scoreless did a nice job bothering and staying in front of Anthony and McDermott held up his end defending J.R. Smith, who had just six points on two of eight shooting. The Knicks got a good start from Amar’e Stoudemire with four baskets early and some good finishes and were hanging in down 24-20 after one quarter when the Bulls closed with an 8-0 run. In that stretch, McDermott found Brooks for a three with a nice pump fake to draw a double and pass, Brooks had a runner and Pau picked up a loose ball and made a short jumper. That group opened the second quarter and quickly began to take the game away as Brooks again made a high degree of difficulty runner, McDermott scored on a drive and Gibson spun inside and powered over Jason Smith. McDermott then made a three with Rose back and finding him for a 42-30 lead that pretty much began to quiet Madison Square Garden for the night. The Knicks were without Jose Calderon as a late scratch and Andrea Bargnani, and could get little offensive flow as they seek to implement Jackson’s offensive principles. Their starters did compete and substitute point guard Shane Larkin put some nice moves on Rose to break past at times. The Knicks kept it within 53-43 at halftime. But the Bulls’ starters clearly changed the pace to open the second half. The speed caught the Knicks off balance, getting Noah and Gasol to the free throw line. Rose pushed the ball, finding Hinrich for a corner three and foul and Rose then beat the defense and passed to Gasol for a 20 footer. Obviously more in the flow of the offense now, Rose made a pair of pull up 15 footers to put the Bulls ahead 65-49. Then it was Hinrich with a three on a Noah find, Gasol dunking an interior pass from Gibson and then Brooks dribbling and drawing the defense in a Steve Nash criss cross to find Gibson alone underneath for a slam dunk and 20-point lead with 4:08 remaining in the third quarter. “I’m just following Thibs’ orders,” said Gibson. “He tells me to go to work; he believes in my post game. He’s been telling me that since last year, telling me that almost since my sophomore year, saying, ‘I want to get you in the post more; you work hard.’ And I’ve just been getting better going against Pau every day. He pushed me, we go at it; it shows how I’ve been playing and my teammates have been looking for me. The G-man, Gibson and Gasol, then took turns shooting down the Knicks to give the Bulls an 84-60 lead after three quarters and give new meaning to the Knicks song of “Go New York, Go New York, Go.” Yes, going, going gone for this game. The Knicks’ pretty much gave in as the Bulls couldn’t help having some fun. Perhaps other than Thibodeau, who angrily drew a technical foul complaining about a non call against Gasol with the Bulls leading by 24 early in the fourth quarter. It was that kind of night as official Joey Crawford, who didn’t signal the technical, then walked by and had Thibodeau laughing out loud with his comments. It was not funny at all for the Knicks as Brooks crossed over on a drive and then passed behind his back to Gibson for a short hook shot. And then McDermott rebounded and dribbled full court for a pull up three-pointer to put the Bulls up 33 at the famous arena on 33rd street. Yes, make it 33 skidoo.